A few years ago, an artist living in Amman, Jordan, saved a trove of 881 film cans and their contents from a trash pile at the defunct Russian Cultural Center. The Royal Film Commission Jordan agreed to store them, and they sat in a garage on a busy market street, largely forgotten. Eventually they came to the attention of Matthew Epler, an American visual artist and New York University graduate student who was teaching at the Red Sea Institute of Cinematic Arts, in Aqaba. “Within them could be (and most likely are) clues of serious cultural significance leading from this dusty garage all the way to the USSR and back again,” Epler wrote in MIAN in 2010. Epler took on the task of preserving the films because he was aware that Jordan, a country with little current film industry, and a history of theatres closing by the score to be replaced by pirated copies of Hollywood blockbusters for home consumption, might become the collection’s graveyard. He soon discovered that the trove contained both 35mm and 16mm films. 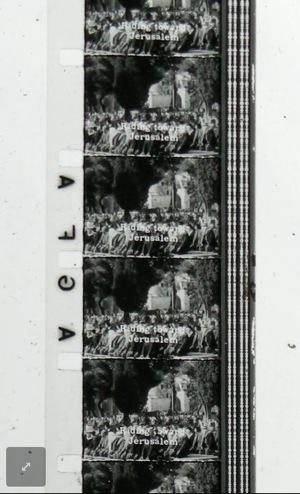 The 35mm prints were largely Russian fiction features with Arabic and sometimes English and French subtitles. The cans’ labels were all in Russian, and indicated that the material dated from the 1930s to the 1980s, and in most cases came from SovExportFilm, a Soviet-era agency that exported films around the world. 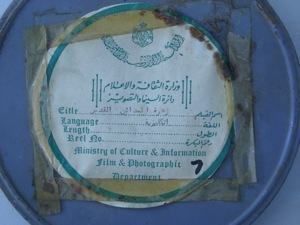 The 16-mm items were primarily documentary films, from the Jordanian Ministry of Culture and Information, or from independent filmmakers, in cans labeled by hand, in Arabic. They were locally produced, “a historically significant find for Jordan,” Epler noted. • A documentary confirmed to be part of the PLO Film Archive, lost since 1985. • Footage of King Hussein in 1968 addressing the United Nations in the aftermath of the Six Day War. • Documentary footage of Jerusalem in 1968 and its aftermath. • Unidentified propaganda films from Vietnam made to highlight relations among Vietnam, Russia, and political activists in the Middle East in the 1960s and 1970s. • Russian feature films sent as part of a cultural exchange between Russian and Arab partners, ranging from the 1920s to the 1980s. Epler sought help in identifying the films and, more urgently, finding a safer location. His goal has been to digitize the films, and post them freely online for researchers and other interested parties. In 2010, he and colleagues photographed the lids of the 881 cans. 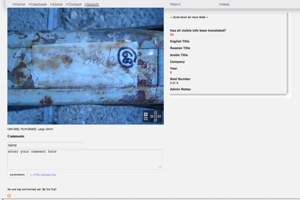 They posted images from the cans to a Picasa photo gallery, hoping that film archivists and others might be able to help him answer his questions. He put out the word that anyone interested in helping to translate the Russian text, or who had leads of any kind, should get in touch. He created a database for that purpose. Awesh and her Bard students have done a great deal of the translating and the project has also benefitted from bursts of help from interested PhD candidates and general enthusiasts who speak Russian or Arabic doing a few titles at a time. With all that, 600 of the 850 cans have now been translated. A list of the titles in Englishis online. In a significant step, 11 of the reels have been digitized and released, online (see, end of this article). Eventually, Epler and his colleagues hope to make preservation-quality digital copies of all the films, and to provide similar online viewing access to them. He is trying to organize an advisory board of filmmakers, scholars, historians, and community leaders, to oversee the preservation project. They will also be asked to find “stakeholders” with knowledge, resources, and financial means of support. Long-term goals include construction of a permanent archive to house the films already found, and others that are located. It would make high-definition copies of such films for research and viewing. 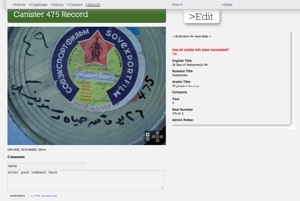 A for-profit archive may also be in the future, to capture interest in Middle East and North African film among broadcasters around the world. High-resolution scans of films would be licensed to networks, production companies, and institutions. Profits would help support the archive. Epler continues to be certain that the current collection is unusual. “We haven’t come across anyone claiming to have a collection similar to this. There is evidence, however, that private individuals house the remains of old collections. My first glimpse of this was through Azza El-Hassan’s documentary Kings and Extras, which attempts to trace the history of the lost PLO film archive. Epler presented the project at the Orphans 8 Symposium this past Spring at the Museum of the Moving Image. The warm response encouraged him and his colleagues to start Facebook and Twitter accounts to keep track of supporters. In May 2012, Leah Caldwell, a journalist with a Beirut newsletter Al Akbhar, wrote a thorough article about the collection. Unknown Vietnamese Communist Film (1970) – 16mm? Matthew Epler is a graduate of USC’s School of Cinematic Arts and a current master’s candidate at NYU’s Interactive Telecommunications Program. He was a founding faculty member of the Red Sea Institute of Cinematic Arts in Jordan where he taught film history and theory for three years.